iPhone SE Will Still Have 16GB Storage Option? According to the leaked image showing the retail packaging of the upcoming iPhone SE, the handset will have a base storage of 16GB and NFC for Apple Pay. The photo has been first spotted on the Chinese social network Weibo, so its origin is rather questionable. Anyway, the image reveals the specs of the new 4-inch iPhone and confirms previous rumors about the device. 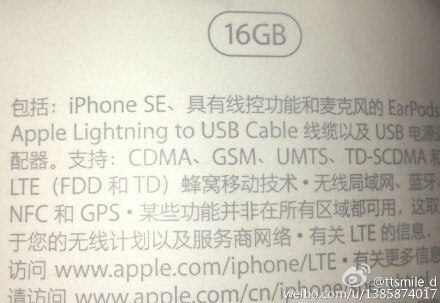 In particular, the photo demonstrates that the phone will come with the Lightning to USB cable and EarPods. This indicates that the iPhone SE will retain the headphone jack, just like it was previously expected. Apart from that, the device should support LTE as well as CDMA and GSM networks. As to the design of the new smartphone, it is likely to match the design of the iPhone 5s released back in 2013. It is supposed to have an A9 chip, a 12-megapixel camera and the support of Live Photos. The iPhone SE will be unveiled on Monday at Apple’s dedicated media event alongside the new iPad and slightly tweaked Apple Watch.